Father Rob Hagan has been in Sister Jean Dolores Schmidt’s shoes before. Also a basketball team chaplain, Sister Jean, 98, has been serving in that role for Loyola University Chicago men’s basketball team since 1994. She saw the Ramblers’ first national title in 1963 when serving at Mundelein College, which later merged with Loyola. 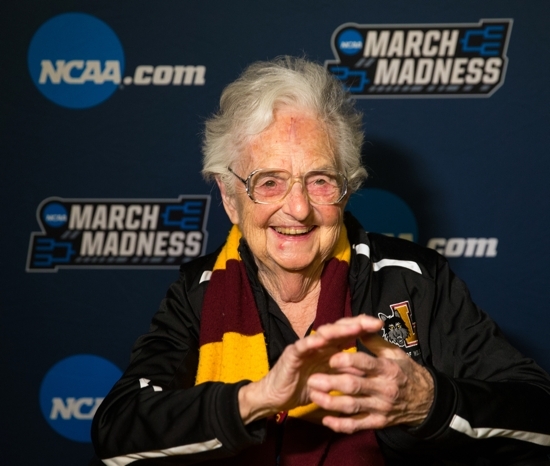 The retired Sister of Charity of the Blessed Virgin Mary has become a media sensation during the Ramblers’ recent run to the Final Four in San Antonio March 31-April 2, the program’s first NCAA tournament appearance since 1985. Father Hagan has been Villanova’s basketball chaplain since 2004 and will join the Wildcats in their third Final Four since 2009. He has seen the program become one of college basketball’s elite, which includes a national title in 2016. Villanova plays March 31 against the University of Kansas at 8:49 p.m. EDT. Father Hagan plans to offer the Easter Vigil Mass for players after the game. Loyola plays the University of Michigan in the first Final Four game March 31 at 6:09 p.m. EDT. Wins by Loyola and Villanova would set up a Ramblers-Wildcats title game April 2 at 9:20 p.m. EDT.